It’s been way too long. I’m not sure where January has gone. Because reasons. Anyway everything’s in place ready to start shipping out the 4th run Jasper sets – so I’ll start sending out the Paypal invoices for everyone I have emails. This will take a while - but if you think you should be on the list and haven't got a paypal invoice or PM by the weekend send me a PM. A note about the 4th run PCBs. – unfortunately a small error crept in with the amplified ’phones output jack. The purpose of the modification was to amend the headphone jack to allow use of the more readily available mono Cliff CL1384/FCR1281 jack sockets – the same used in a lot of eurorack kit. The smallest of changes and I screwed it up. Mea culpa. It doesn’t affect anything else on the Jasper – I only found out after making up one of the PCBs just to make sure everything was OK. It still sounds great and otherwise works identically to the previous runs. The line-out jack works exactly as before on both channels – and in any case this is best for modern headphones or amplifiers. The amplified 'phones output still works, and disconnects the speaker when a cable is plugged in, but the signal only comes out of one channel when a stereo cable is used. My apologies. I've documented the change needed to fix it and will add this to the first post of the build thread. [Jasper website] - I've finally got round to setting up a website about Jasper. It'll be used mainly as an information store/blog, and I hope to link to and highlight your Jasper builds. 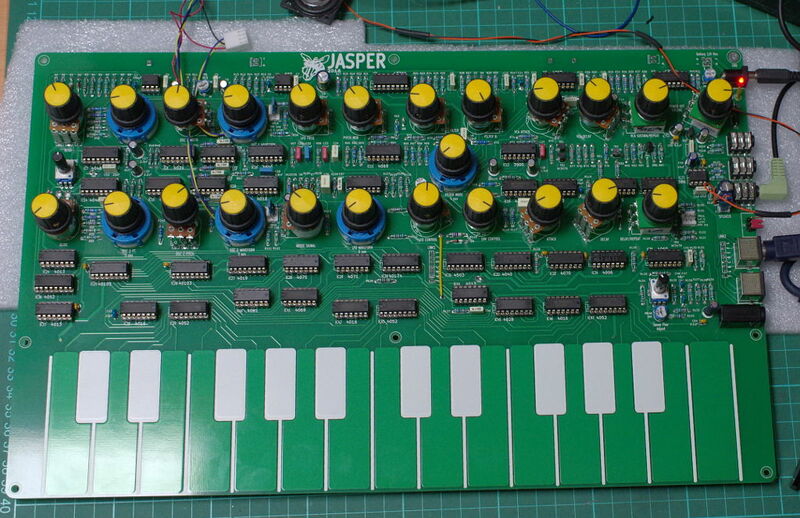 It's jaspersynth.co.uk - a bit barebones at the moment, but I hope to add to it over the next few weeks. The 3rd run is shipping now, as you may have gathered. Time commitments have meant I've not kept up with the various threads. At the moment, all the boards of the 3rd run are accounted for. I'm still waiting to hear back from some people on the 3rd run list. I plan on sorting out a 4th run very soon, so I am taking names/reservations for that one. If you want to get on the reserve list, send me a PM. If you include your location and Paypal email I can send out an invoice when they're ready to ship. Sending a PM means I will get your message. As before I will not be providing full kits - just the PCBs, Omeg switched pots, jacks, CD4006 IC, trimmers. All the other stuff is easily obtainable. See the BOM at the start of the build thread. When: I expect to be able to ship in October or early November when the PCBs and FCR1295 jacks I supply with them are received from the manufacturers. When ready to ship I will PM asking for delivery details and Paypal email address if I don't already have them. If you've already supplied details I will send a Paypal invoice. Pricing and what's supplied Details of pricing for the second run are in this forum post. * Trimmers: 2x Song Huei 9mm tall trimmers from Thonk, and the four 6mm trimmers. * Sockets: 3x Cliff FCR1295 3.5mm stereo jack sockets; 2x 8pin mini DIN sockets for the Link port; 1x 2.1mm DC power jack. You will need to source the rest of the components, pots and rotary switches. And work out how you want to enclose the PCBs. Postage/shipping is extra, and is determined by weight – up to 2Kg will go by Royal Mail. Australia/Rest of World is £18.15. Standard airmail is cheaper, but has no tracking available. So once it’s sent, there’s nothing to do if it goes missing en-route. Let me know if you want this, but it’ll be at your own risk. Packages heavier than 2kg (i.e. >2 sets) will need to go by courier, so I’ll use Parcel2Go or Interparcel on a case-by-case basis to get a reasonable price. I'm still waiting on responses from people on the waiting list for the second run, so if included, then all the PCBs are now accounted for. So I'm starting a list for a third PCB run. If I get any cancellations then I'll move people up. If you want to go on the list, it's best to PM me so I can keep track. 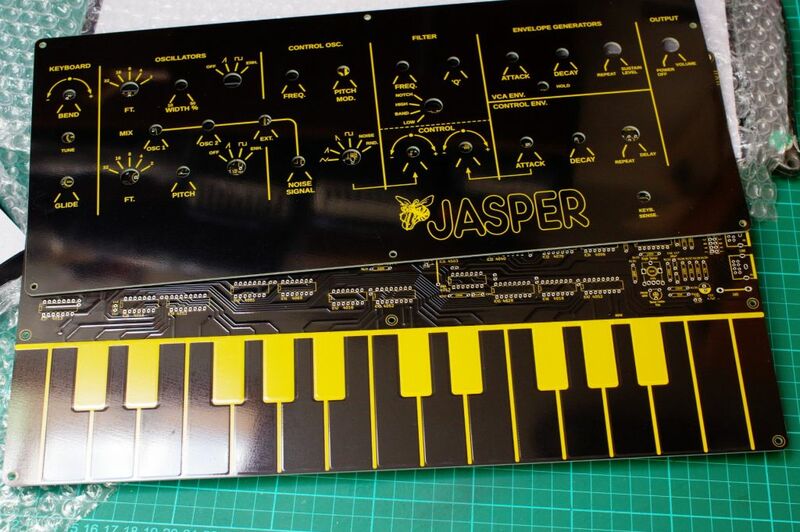 It's been too long, for various reasons, but the second Jasper PCB run is ready to ship! Boards of the first run have started shipping! Latest BOM and a couple of other docs have been added to the build thread. I'll start packing the orders of this first run this weekend, and I'll start shipping them on Monday 21st March. The build thread is here: https://www.muffwiggler.com/forum/viewtopic.php?t=157937 Just a placeholder at the moment, but all the BOM and other docs will be placed in the first post in the thread. 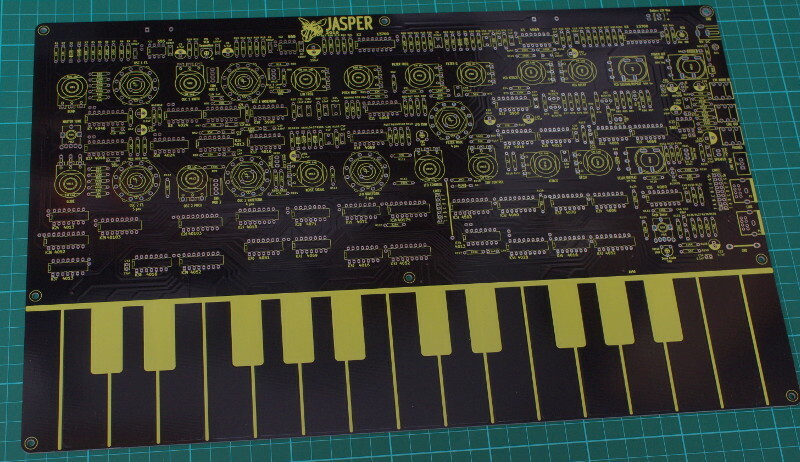 There was a serious problem with the silkscreen on the Jasper PCBs delivered. They're going back for rework, which I'm informed will take three weeks - so despatch of the PCBs will be delayed. Sorry. Good news is the panel PCBs are fine. Must be something in the air causing a sudden swarm of insects.... I've just seen dojaja's post about his excellent looking EDP Wasp clone (https://www.muffwiggler.com/forum/viewtopic.php?t=151457). As it happens on the workbench is Jasper - an EDP Wasp clone I've been working on. It's a first prototype PCB at the moment but it works fine and sounds great. Apart from the CD4006 in the noise circuit it uses easily available components - all the ICs are new TI parts available from Mouser or Farnell. The 3080s in the original are replaced with a pair of LM13700s. The transistors are BC547 and BC557. The rotary switches are normal Alpha 2x6 PCB pin switches, the normal pots are 16mm Alpha vertical pots from (MusikDing or Smallbear) with the pins straightened to match the height of the switched pots and rotary switches. The switched pots are Omeg ECO16 types available from CPC/Rapid/Conrad. All the controls are mounted on the top side of the PCB. Cliff stereo 3.5mm audio jacks, and 8pin mini-DIN sockets for the Link port, and a 2.1mm DC jack are soldered onto the right hand side of the PCB. Electronically it's almost identical to the original Wasp, but I had to change some component values for it to work with 1M potentiometers (the original used a number of 2M2 pots - not common now). Also the keyboard sense circuit had to be altered to make it work with a new TI CD4069 chip. There are some extra decoupling caps on some of the ICs and LM386. It also uses an MCP1702-5002 LDO voltage regulator in order to work even longer on batteries. Without the speaker active, it draws about 30-40mA, and about 120mA when driving a speaker. Notch filter setting. There are a pair of unused CD4069 units in the filter I used to implement a notch filter, like Juergen Haible's Wasp filter clone. Buffered audio input. This uses a pair of unused CD4069 units on the right hand side to implement a buffer with variable gain that can be mixed with the two oscillators and noise. Oscillator volume pot headers - like the Wasp deluxe. These fit via flying wires to the panel, or can be jumpered as on my prototype. 'Enhanced' waveform option headers: like the Gnat. This is a PWMed pulse wave with a fixed LFO made using a single 4069. Two of these are on a small PCB, and connect with flying wires to the main board. I'm awaiting delivery of this prototype PCB. The headers for this are kludged onto my prototype board, but are included if I make another set of boards. Two 4x AA battery holders with PCB pins can be attached underneath the PCB. Intended for use with 8x NiMh batteries. The Link port is implemented using 8pin mini-DIN cables and sockets. These are easily available, and save confusing Link with MIDI. I made an option of using the spare wire to carry power - so Jasper can power other devices using the Link port. I've got an unfinished control panel and bottom plate in a CAD program - haven't decided whether to use an aluminium panel, or use laser etched/cut wood or acrylic. The PCB should work OK in different styles of enclosure - it is 250mm x 398mm. There's no MIDI on the PCB - but it should be straightforward enough to make a simple MIDI-Link controller using a microcontroller. Update 26 January 2016 PCBs are being manufactured. Due towards the end of February (delay because of Chinese New Year). BOM and other info will be posted below. There's now a reserve list for a possible future run. Do you have plans to make the PCBs available as a DIY project? Will you be offering PCBs? Wow excellent work! Looks fantastic, would love to build one. How does that keyboard work? Would love one. Great work! I was hoping to do a run of PCBs - and make the designs for the control panel and baseplate available for people to adapt for their own purposes. No idea what the price per PCB will be, as this depends very much on the how big the run is. It's a capacitative touch keyboard. Place your finger on a 'key' and the change in capacitance interrupts the keyboard scanning, then sends the number of the key to be decoded by a block of logic to divide the frequency of the master oscillator. Or something like that. Nearly all the chips below the lower row of controls handle the keyboard and note division. The sensitivity can be adjusted with a pot, as the sensitivity can vary with conditions and player. Thanks. I intended it to be pretty close to the original - but taking advantage of modern PCB design to make it easy to build, using fairly easy to obtain components. I'm working on a build-guide and BOM... It's probably a good idea to have an oscilloscope available for testing if you're building one. When I started this project I was surprised no one had made a public Wasp clone before, other than the Elby Designs cased version. Now another has turned up - I wonder if there are any more closet DIY Wasps lurking about. Thanks! The pot wires bend a little too easily as they're quite high off the board, so a top control panel would be recommended, to hold them in place. very impressive. if you decide to make some PCB available i'd be interested. btw, are the pots not aligned horizontally or is it an optical illusion? They're aligned on the PCB. Just my wonky soldering - or rather an optical illusion. On a final build, it will be best to solder the pots when they're bolted on the control panel to ensure the correct position and height. I would definitely be interested in a pcb if you decide to do a run. any word on a pcb run?